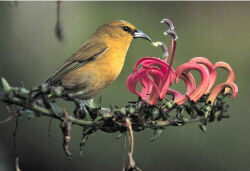 Forest birds comprise a traditional conservation target in the Hawaiian ecoregion. Stream communities cut across ecological system boundaries and bear unique threats. Native-dominated ecological systems comprise our primary conservation targets. 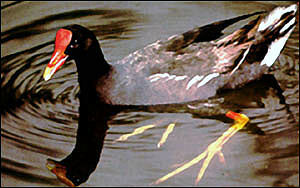 Waterbird concentrations represent special threats and management needs. Coastal vegetation is highly vulnerable to human disturbance and global warming. An explicit set of conservation targets was not developed in the 1998 ecoregional plan. Part of the new standards compliance for ERA II was to determine the specific ecological systems, natural communities, species, and special features that together represent the biodiversity of the ecoregion. Following the principles outlined in Geography of Hope, we developed a set of conservation targets. The vast majority of terrestrial and aquatic species and natural communities are nested within 10 primary ecological systems, so these systems became the primary building blocks of this 2nd iteration plan. There is remarkable congruence between the distribution of most natural communities and the emergent ecological systems they comprise. For the majority of the 175 described native natural communities (see Tables), nesting within larger ecological systems is justified on the basis of both geospatial congruences, and common threats and management needs. However, one freshwater natural community (Hawaiian Continuous Perennial Stream Community) was not fully embedded within native ecological systems. Streams run across ecological system boundaries, extend through alien-dominated regions, and enter the marine system. They also bear a number of target-specific threats and management needs, and thus, warranted designation as a specific conservation target. In 2008, the coastal ecosystem was assessed via a statewide mapping of Coastal Vegetation, and Anchialine Pool community occurrences. Their distribution across the archipelago is shown in a separate coastal target table below. The remarkably high levels of endemism in the Hawaiian High Islands Ecoregion offers thousands of potential endemic species targets. Luckily, as with natural communities, most individual species in Hawai‘i nest readily within natural communities and ecological systems, and are subject to the same set of threats and management context. Thus, instead of identifying individual species targets, we recognize that the great majority of endemic species are nested in and constitute the natural communities and ecological systems which have been selected as conservation targets. The plan addresses patterns of species endemism across the archipelago by establishing stratification units reflecting these biogeographical patterns (see Goals). Most species were adequately covered by the focus on ecological systems. However,we felt that delineating three species concentrations would ensure assessment of biodiversity components that were of particularly outstanding significance (i.e., forest birds), or were not adequately nested within the native ecological systems. We selected concentrations of two major guilds of terrestrial Hawaiian birds (forest birds and waterbirds) to acknowledge their significance and special conservation needs. Both groups have been well documented by the U.S. Fish and Wildlife Service, and the U.S.Geological Service, Biological Resources Discipline (e.g., Camp et al, in prep). We also analyzed rare plant concentrations across the archipelago and identified occurrences that fell outside of native ecological system boundaries. These14 conservation targets became the basis for all subsequent steps in the terrestrial ecoregion planning process. Their distribution across the ecoregion was documented (see summary table below). Once targets were identified and characterized across the ecoregion, assessments of viability were conducted. In 2008, a fourth concentration, Sea bird nesting concentration,was added in the coastal assessment to the three terrestrial concentration targets, and is shown in the coastal target table below. Summary table of conservation targets across the Hawaiian Ecoregion. Each blue cell indicates presence of the particular conservation target. For example, the Alpine System (ALP) is present only on the islands of Maui and Hawai‘i, and in the conservation areas of East Maui, Mauna Kea, Ka‘ū - Kapāpala, Kona, and Pōhakuloa -Pu‘u Wa‘awa‘a. A low island, such as Kaho‘olawe (KAH) only includes occurrences of Lowland Dry (LD) and Dry Cliff (DC) systems. 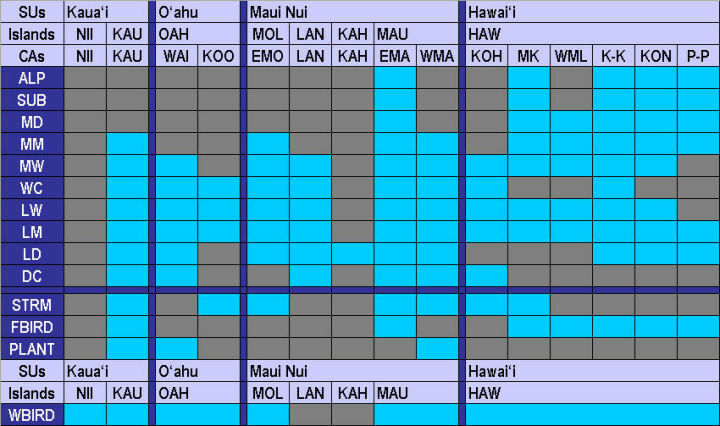 Key to abbreviations: SU = Stratification Unit; ES = Ecological System, NII = Ni‘ihau, KAU = Kaua‘i, OAH = O‘ahu, MOL = Moloka‘i, LAN = Lāna‘i, KAH = Kaho‘olawe, MAU = Maui, HAW = Hawai‘i; Conservation Areas: NII = Ni‘ihau, KAU = Kaua‘i, WAI = Wai‘anae, KOO = Ko‘olau, EMO = East Moloka‘i, LAN = Lāna‘i, KAH = Kaho‘olawe, EMA = East Maui, WMA = West Maui, KOH = Kohala, MK = Mauna Kea, WML = Windward Mauna Loa, K-K = Ka‘ū - Kapāpala, KON = Kona, P-P = Pōhakuloa - Pu‘u Wa‘awa‘a; Targets: ALP = Alpine System, SUB = Subalpine System, MD = Montane Dry System, MM = Montane Mesic System, MW = Montane Wet System, WC = Wet Cliff System, LW = Lowland Wet System, LM = Lowland Mesic System, LD = Lowland Dry System, DC = Dry Cliff System; STRM = Hawaiian Continuous Perennial Stream Community, FBIRD = Forest Bird Concentration, PLANT = Rare Plant Concentration, WBIRD = Waterbird Concentration. Summary table of conservation targets selected in the 2008Coastal assessment, and their distribution across the Hawaiian archipelago. This coastal assessment does not include the Northwestern Hawaiian Islands, and does not recognize the same conservation areas as the 1998 terrestrial assessment. Offshore islets are included with their nearest main island.